When I was offered the opportunity to work in Seville I immediately began looking through the guidebooks that I had consulted for my trip to Andalucía in 2013. I was curious to explore more of the cities in this wonderful region of Spain that I simply didn’t have the time to do during my previous visit. Regular readers may remember the escape to the country and visit to Cordoba and this weekend it was time to visit a place that had caught my sight very early into my research. And still has a firm hold on it. Ronda is a truly magnificent city built into the Sierras of the Malaga province of Andalucía, with terrain in stark contrast to the flat plains of Seville. Many literary legends including Orson Welles and Ernest Hemingway spent time there, with these two spending many a summer in the old quarter known as La Ciudad. The December morning of our journey there gifted us with dense fog as our bus climbed into the mountains but this soon cleared, making us feel as if we had driven higher than the clouds. Even from the bus we were treated to spectacular views of the mountainous countryside but upon arrival in Ronda were truly spoilt. 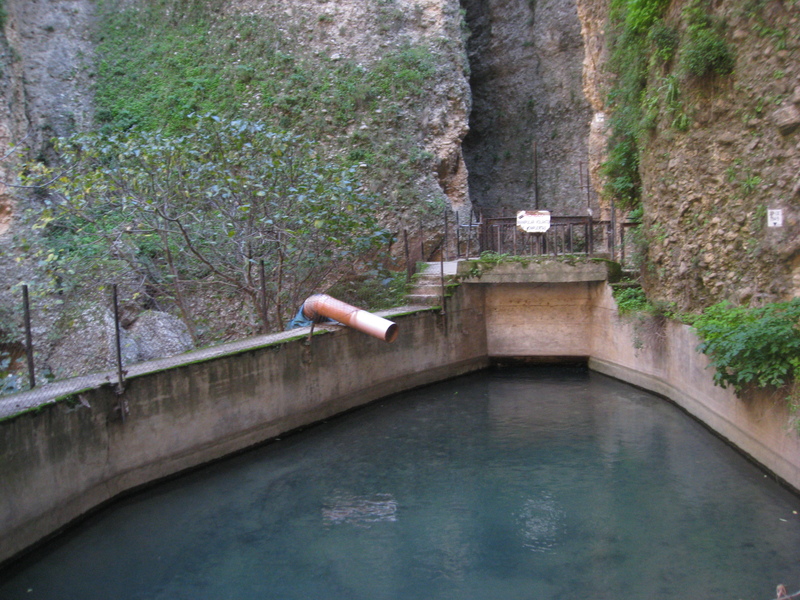 The first sight seen was actually the Bullring of Ronda, which is the oldest in Spain. Readers familiar with Birmingham may still get the same reaction I do when hearing the term Bullring, with my mind venturing that huge shopping centre. This Bullring serves a far more sinister purpose, on which I do not intend to dwell. Architecturally it was indeed beautiful but for me what goes on within those walls during the summer months made for an uneasy feeling when walking past it. Just past this was the first scenic overlook which felt like we were truly in a city built into the clouds. The horizon was a long way off and populated with rugged mountains to make for a scene that surpassed all my expectations. 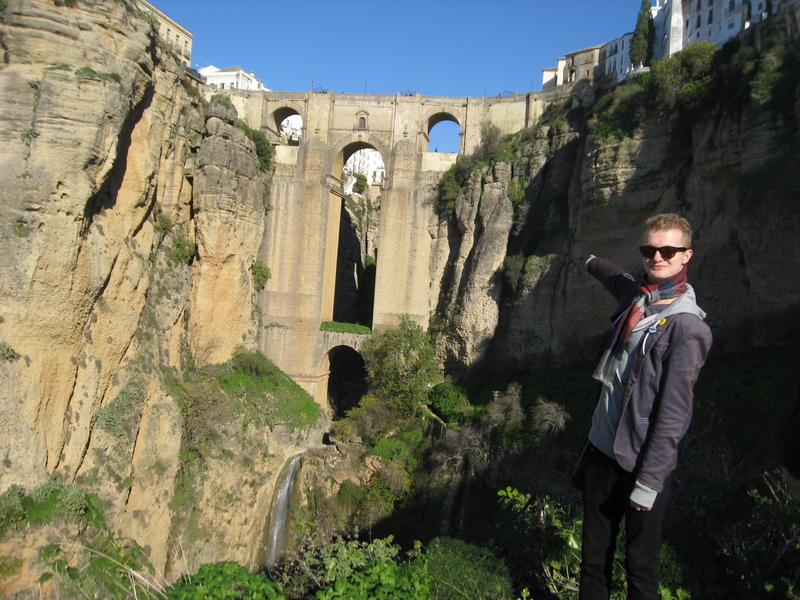 With places like this it’s awfully easy to see why the production for Game of Thrones was in Andalucía this autumn. It also gives one a huge amount of admiration for the medieval construction crews who built this city; with none of the powerful equipment or lightweight materials we have today. It is Puente Nuevo (new bridge) where this admiration became the strongest for me. 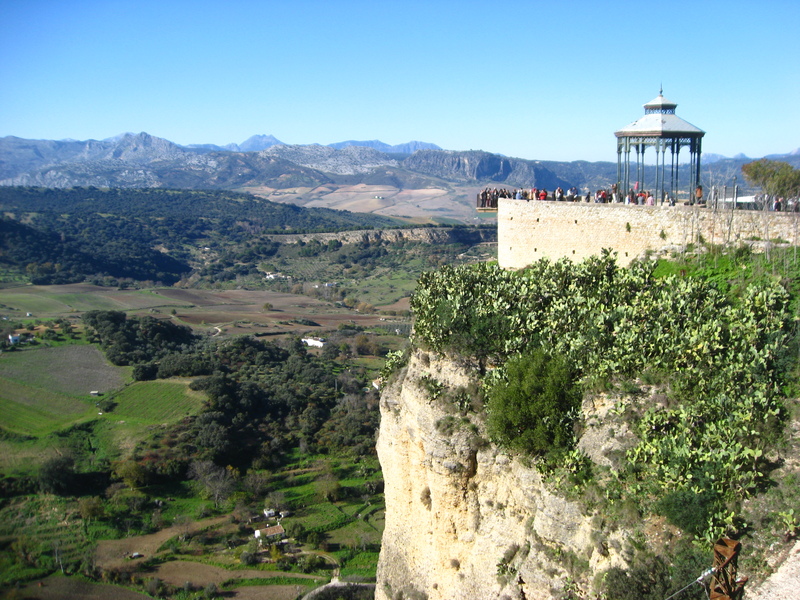 This is the iconic sight of Ronda and one of the most famous in all of Spain. 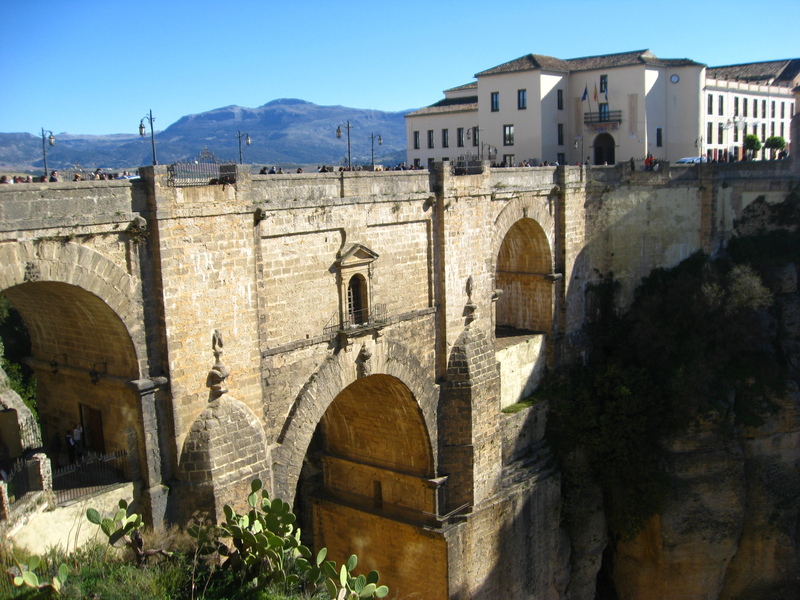 As the name may well suggest, it is the newest of the three bridges on Ronda – with Puente Romano and Puente Viejo being built much earlier. Nuevo was completed in 1793 and is the tallest of the three. This makes it truly spectacular, and slightly vertigo inducing, as it is around one hundred and twenty metres to the floor of the gorge below. The design and engineering of this bridge is quite remarkable – let’s hope that it can withstand the extra weight that has come about with the spreading of the lovers’ padlock tradition from Paris! The walking trail through Ronda takes a right hand turn out of the city that is perhaps one of the best scenic routes I have laid eyes upon. Well, best in terms of the views it offers as the trail itself has a rather ominous sign at the start to warn hikers of its bad condition. 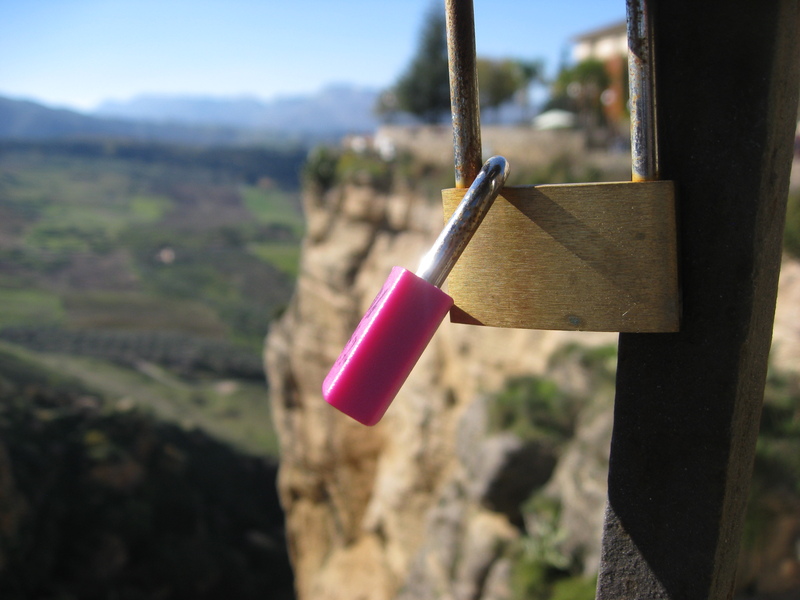 Throwing caution to the wind allows walkers to reach the bottom of the gorge and it is here where Puente Nuevo and Ronda as a whole become even more staggering. Being able to look up at a whole city like this is a rare and unique perspective, making for visual memories I will cherish forever. Taking the trail under the bridge led to the somewhat creepy water mine system, which came complete with abandoned huts and monitoring stations. With this discovery we suddenly became enthusiastic to be out of the gorge before the sun went down. I have watched The Descent one too many times, it seems. My time in Seville is rapidly drawing to a close, in fact once I return to Spain after my graduation this weekend I will have but six days left until my return to Old Blighty. As this weekend is dedicated to my graduation in England, this past Saturday night was my last time to enjoy the weekend nightlife of Seville. Fun Club was the nocturnal destination of choice, and by gosh did it live up to its name. From Paolo Nutini to Vampire Weekend, or The Beatles to The Kinks, the song list was completely spiffing. A night well spent, shame that I fell asleep at 7am just as Goodfellas was getting going.